September saw the launch of what may well be the world’s first ocean-going survey vessel to offer both manned and unmanned operational capability. USV Maxlimer is primarily the brainchild of UK company Sea-Kit International, which developed this first-in-class craft to serve as an autonomous underwater vehicle (AUV) mothership. USV Maxlimer was constructed in aluminium by Essex-based boatbuilder Hush Craft Ltd, a relatively new construction specialist formed by former CTruk managing director Ben Simpson. Hush Craft also produced the vessel’s diesel-electric hybrid system, comprising two DC generators powering a pair of 18kW engines, driving twin fixed-pitch, 400mm-diameter, electric azipod propellers. 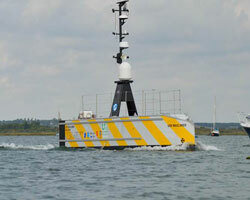 The Sea-Kit is also fitted with a pair of 5kW bow thrusters. This arrangement enables a range of 12,000nm and an endurance of 270 days, depending on speed, with top speed calculated to be 8knots. The 11.75m loa Sea-Kit has the capacity for a payload of 2.5tonnes, meaning that not only can the ship carry, launch and recover most commercially available AUVs, but it can also be deployed for other research and survey-related tasks, such as multibeam survey missions. Bielecki comments: “The overall payload area can be changed depending on the mission the vessel is built for. For the multibeam mapping variant, we can make additions to the hull to ensure even better speed, range and endurance.” The entire vessel can be fitted inside a single standard ISO 40ft (12.2m) shipping container. Compliance with COLREGS remains a challenge, he says, particularly given the absence of content related to unmanned vessels within those regulations. “The COLREGS’ definition of maintaining a lookout at all times could be problematic,” Bielecki says. USV Maxilimer has been fitted with a suite of CCTV cameras to address this point, though the more cameras used equates to more bandwidth guzzled. Next year looks to be equally busy for the Sea-Kit team. Having assessed the concept’s suitability as an offshore AUV support and survey ship, the company wants to test the Sea-Kit class as a possible monitoring vessel, for use by law enforcement, port state control (PSC) authorities and/or coast guard agencies. Ultimately, the Sea-Kit concept could one day be employed as a dedicated autonomous firefighting or first responder vessel. Equipped with fire monitors and pumps, the ship could be programmed to advance directly into burning port or coastal areas, or towards burning vessels, to tackle blazes head-on. Similarly, it could be sent into areas affected by chemical, biological, radiological and nuclear (CBRN) attacks – areas typically considered ‘death traps’ – to extinguish chemical blazes and collect CBRN environmental samples without exposing human personnel to the risks of toxic smoke inhalation, serious physical burns and explosions.